Is Jurrell Casey bound for Honolulu after breakout season? 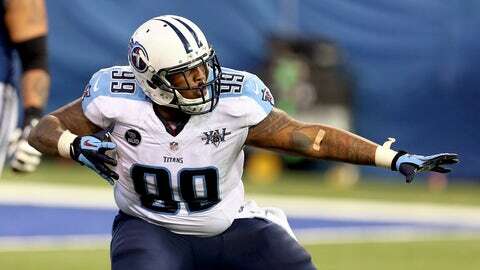 Jurrell Casey leads the Titans with 8.0 sacks in 2013. Tennessee Titans defensive tackle Jurrell Casey had a simple plan: Get leaner and lighter in the offseason to last on the field longer. He followed the blueprint and it has resulted in a breakout third season for the former USC star. Casey, who leads the team in sacks (8.0), also is understanding defensive concepts more, which enables him to react to what he sees on the field. "Other teams watch film on you and start to figure out your techniques and the way you like to play," Casey told FOXSports.com in a telephone interview Tuesday. "You have to be able to counter that by knowing what’s coming before it comes, so you can have the upper hand on the play. I think that’s been a big factor this season is me knowing what’s coming before it even comes." Coming into the season, Casey had his sights set on Titans defensive assistant Keith Millard’s record for most sacks by an interior lineman. His hope was to bring down the opponents’ quarterback 19 times, breaking Millard’s 24-year-old mark. To do that he knew he needed to work on his endurance, shed some added pounds and stay fresh during the season. He traded in trips to the drive thru for orders of fresh seafood and steamed vegetables. "If I go out it’s just salmon or maybe a salad," Casey said. "I stay away from steaks and all of that and it has helped." Another element to his success began in the offseason, working with trainer Travelle Gaines on his endurance. Casey understood to maximize his potential, he needed to be on the field. "When you’re getting tired, you have to maintain your technique," Casey said. "That was the biggest thing for me, making sure I stay with my technique when I’m exhausted out there. That all came with the extra running and shedding off a couple of pounds. Now I’m able to hold up for more than three or four plays, now it’s six or seven and not letting my technique get sloppy because I’m tired. My conditioning has definitely helped me stay out on the field longer." As he focused in on his fundamentals, the other stuff has come naturally. Time spent in the film room allows him to pick up on the opposition’s tendencies. It’s enabled him to thrive in Jerry Gray’s react-first-think-later scheme. "We’ve been more aggressive and been able to let loose. The game has slowed down for me." Casey declares that the 5-7 Titans are motivated to finish strong. They must win their four remaining games if they hope to decide their own fate. Finding a way to finish is paramount. The challenge begins this week in a trip to Denver. The Broncos average a league leading 38.7 points a game and Peyton Manning is threatening to break single-season records, but that doesn’t intimidate Casey. "There’s no doubt in my mind that we can beat these guys," he answered. "It’s easily done. It’s just about everyone coming out to play. Peyton is a great quarterback, but if we can get the pressure on him anything can pan out. We just have to lock up their receivers and don’t let Peyton sit back there and bake a cake."